Blouses, sweaters, and T-shirts come in so many fantastic styles that having to choose which one to draw is like being in a candy store — where do you start? As always, you start with the basic shapes and add the details that top off any look. Lightly sketch a torso from the front view. We use a woman’s torso for this example. To create the neckline, draw a small curve going from one side of the neck to the other. Use a darker pencil to draw the shirt over the figure’s body. Curve the neckline around the sides of her neck to show how the shirt disappears over her shoulders. Draw straight lines that come down from her underarms and end a little below belly button level. This creates a loose-fitting shirt; if you’d like your shirt tighter, draw the lines closer to the body and hug the curves. Connect the side seams at the bottom with a slightly curved line for the hem. Don’t draw the line straight across, or your shirt will look stiff and lifeless. By adding a slight curve at the sides of the hem, you show how the shirt falls around the hips. 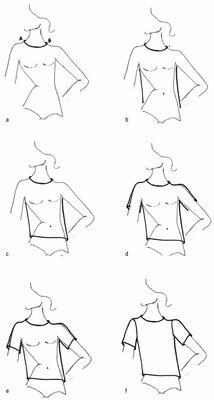 Starting at the neckline, trace over your model’s shoulders and go down the arm, stopping where you’d like to end the sleeve. Draw your sleeve line slightly over the actual shoulder and keep the look a little loose, not stiff. Draw the part of the sleeve on the underside of the arm, starting at the top of the shirt’s sides. End the line slightly farther down the arm than the line for the upper sleeve. Allow the under-the-arm part of the sleeve to fall slightly away from the arm. Connect the upper and lower sleeve lines with a line that goes across the arm and wraps behind it at the ends. Finish with an armhole seam, a slightly curved line that goes from the top of the shoulder to the line that begins at the underarm. This simple shirt also works for guys and kids. You can modify the shape of the sides to create a looser fit for men and children.